The Piano Monster Concert will return to Cedar City's Heritage Center Theater on Tuesday, November 29, 2016 at 7:00 PM. Southern Utah University’s Dr. Christian Bohnenstengel is seeking participants to perform in this year’s concert. This is your chance to be at the ivories instead of in the audience! 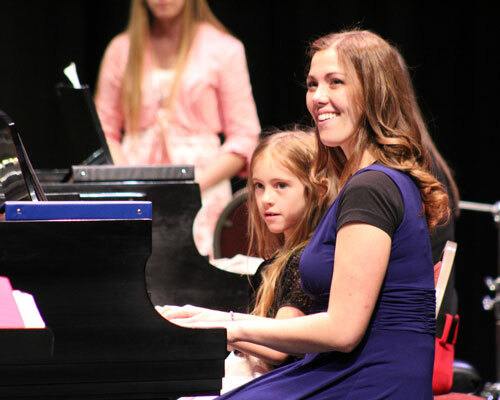 Pianists of all ages and proficiency levels are welcome to participate, including children, adults, and teachers. There will be multiple Steinway and Boston grand pianos on the stage. Two or three pianists will be at each piano, performing piano ensemble music in groups that are divided according to their age and ability. Teachers are also welcome to participate in any group, including SUU's Piano Ensemble, which will perform works of greater difficulty. The repertoire for this year’s concert ranges from beginning pieces, such as “Are You Sleeping” arranged by Edwin McLean and “Frosty the Snowman” by Steve Nelson and Walter Rollins, to advanced compositions, such as “The Bartered Bride Overture” by Bedrich Smetana and “Concerto for Four Pianos” by Bach/Vivaldi. Step out of your solitary practice room and join the piano ensemble for this year’s Piano Monster Concert! Registration for this event is $5 per participant. All registrations must be completed by October 14. The Piano Monster Concert is a wonderful experience for pianists of all ages and levels to collaborate, learn, and perform for an audience in an exceptional concert hall.